Bill's OBX Beach Life: Lake Atlantic, The End is Near?! Tropical season appears to be kicking into gear here on the OBX! All the surf forecasts for this coming week model solid SE swell building throughout the period with peak hitting over the coming weekend. 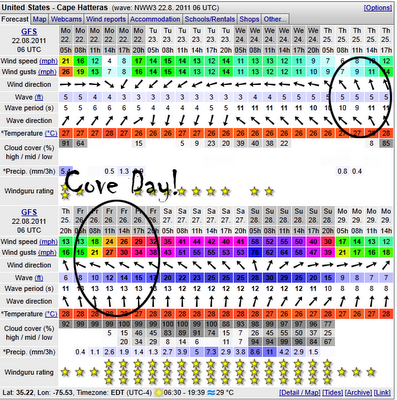 Long swell periods averaging 11 to 12 seconds should provide some some fun surf conditions! Granted the weekend looks like perhaps an impact or close brush by with TS force winds and nasty weather. Its a gamble at this point; however the lead up and follow through should provide for some hopefully excellent surf! 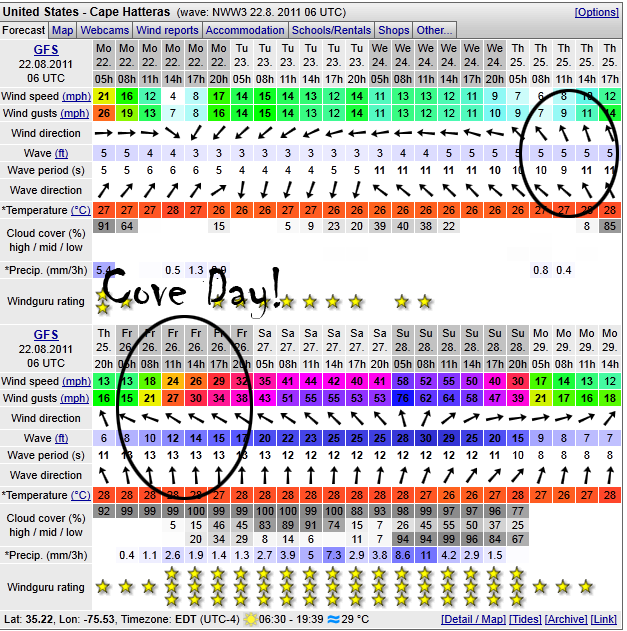 Thursday is the day I am eying with solid swell and SE low to mid teen wind..., perfect for the Sealion! Of course the weekend is a gamble but the regular wave gear will likely get a workout, perhaps at the Cove, or a Coquina?! We are definitely all "greeen" here on the OBX with "Lake Atlantic" basically all summer, but now the page will hopefully turn as we approach peak Tropical season!?! The AWT Hatteras Wave Jam is only a 3 weeks away, and wave training thus far has been minimal. Its time to gear up and dial in!! i want me some of that Irene too. :) hope its a near miss. Sweet on the camera! Yea, the weekend looks sketchy especially if the storm eye tracks near or over the sound. The water temps in there will pump it up for sure. Likely, Thursday will be the best day with cleanest manageable conditions. Friday may also be good, but then its hunker down time for Sat/Sun!